A junior microbiologist is working on a culture from an infected wound. The predominant organism is a catalase positive, gram positive cocci that has grown both aerobically and anaerobically on blood agar and produced yellow colonies on Mannitol Salt Agar. Then he suspects Staphylococcus aureus (the most common cause of wound infections) and performs a slide coagulase. This gives a negative result and he concluded that the organism is probably Staphylococcus epidermidis (skin flora) and issues a report of "No pathogen isolated". Do you agree with this conclusion and if not what would you do? I do not agree with this conclusion, although it is possible that they are correct. The organism is an isolate from a wound swab and is mannitol positive which is initially suggestive of a S. aureus. The slide coagulase is negative which indicates (but doesn’t prove) the organism is not S. aureus. So there are now two test results which are contradictory. Approximately 5-10% of S. aureus are slide coagulase negative, so a negative slide coagulase result should sometimes (but not always) be followed up with a tube test or other alternative. At this point it would probably be best to do a tube coagulase (or latex test) which is very sensitive or perform a Dnase test. Some strains of methicillin resistant Staphylococcus aureus (MRSA) are slide coagulase negative and also negative in the first generation of the latex tests that include fibrinogen and protein A in the reagent. This is not because they are clumping factor negative or protein A negative, but because some have a particular type of capsule that mechanically interferes with the access of the reagent to the staphylococcal cell. 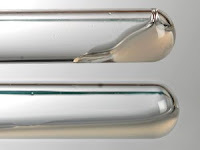 The tube coagulase is the definitive test for S. aureus. This test detects free coag ulase, which is an enzyme produced by S. aureus that is able to catalyse the conversion of the soluble fibrinogen found in plasma into insoluble fibrin. This results in the formation of a clot. How fast the clot occurs depends on both the size and phase of growth of the inoculum, but usually occurs between 4 and 24 hours. Tests that are negative after a 4 hour incubation at 35° C should be held at room temperature and read again after 18 to 24 hours because some strains will produce fibrinolysin/staphylokinase which may lyse the clot; thus giving a false negative result at 24 hours. Practically all strains of S. aureus are tube coagulase positive (Imgae - upper tube). The other issue is with the use of the term "S. epidermidis". If, you satisfactorily concluded that an organism is not S. aureus, then it does not necessarily mean that the organism is S. epidermidis, it simply means that the organism is a "coagulase negative staphylococcus" (CONS). Yes, in this case, the isolate is not S. epidermidis, which is mannitol negative. So the isolate has to be reported as “CONS” or else it has to be identified at species level with additional tests; it will be helpful if the patient has been under immunocompromised condition or any other special circumstances. 1)Repeat both a slide and tube coagulase tests wih proper controls. 3)I would report based on the above results. Slide coagulase test must be confirmed with tube coagulase test, becoz some strains deficient in clumping factor will produce free coagulase, Moreover MRSA strains has capsule masking the bound coagulase/ clumping factor hence to be confirmed with tube coagulase test. Strains negative on slide coagulase test must be confirmed with tube coagulase test, becoz strains deficient in clumping factor will usually produce free coagulase. Moreover, MRSA strains have capsules masking the bound coagulase/ clumping factor.Hence to be confirmed with tube coagulase test. 2.consider morphology was it cluster or any thing else ?. 4. even coagulase negative Staph is considered as a pathogen from wound and some other specimens. Thanks to the participants, who are all actively involved in the discussion on this case.